Our partnership with the Valley Humane League in Alamosa, Colorado has allowed us the opportunity to find homes for another four pups in need! 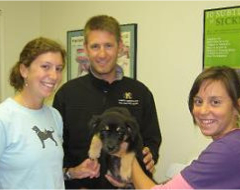 On Monday June 2, 2008, the adorable puppies pictured below were flown in from Colorado. Because our last litter of Rocky Mountain babies were so famous, by the time these four arrived, two of them were already spoken for! “Blanca”, the only girl of the bunch, and “Aspen” both had families ready and waiting. That left us with “Rio” and “Denver”, who after only a few short weeks at NAH, found loving homes of their own. Read about each of these adorable puppies and their new families below. 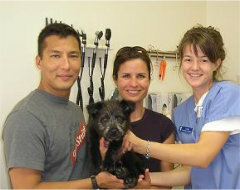 Rio, our lovable terrier mix, went to a wonderful couple who recently lost their dog due to illness. They fell in love with his little black & grey “old man face” just as quickly as we did! Although he loved playing with his friend “Denver”, Rio was very people oriented and couldn’t wait to be held. Every one at NAH would fight over who got to snuggle with the little guy next! Rio and his family have moved south, but promise to be back to see his NAH family. Denver, our black and tan shepherd mix was the trouble-maker! He was constantly wrestling with his siblings, stealing toys and getting into mischief! While Denver loved to play and romp with other dogs, he also had a sweet, cuddly side, too. He would follow the staff around the hospital waiting to be picked up. Denver, now “Remi”, found the perfect family for all sides of his personality! He was adopted by an amazing couple right here in Newport, who have provided him with lots of doggie friends, lots of snuggles, and lots of playtime at the beach! Blanca, now “Sandy”, was our little blonde Golden Retriever mix. Sandy could be best described as a DIVA!! She was very good at letting you know what she wanted… and even better at letting you know if you weren’t giving it to her! Sandy would cry if you wouldn’t pick her up to snuggle fast enough, and she was always teasing her brothers! 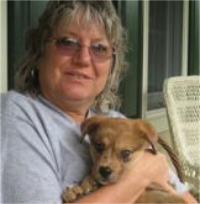 Sandy had the NAH staff laughing constantly, something that her new owner found irresistible! Sandy and her family live in North Kingstown, where we are sure she is running the house and being treated like the little princess she is. Aspen, now “Logan”, was the freckled-faced Aussie mix who melted the hearts of the entire staff. He was definitely the most cuddly puppy of the group. Logan was always very mellow and would rather be snuggling on a lap than playing with the others. 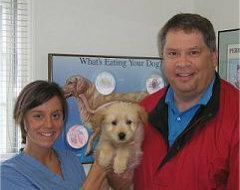 We were all sad to see him go, but happy that he went to one of very best clients! Logan and his wonderful family live in Jamestown. Logan can still charm his way into anyone’s heart, and is putting his calming influence to good use– he and his family are in the process of making him a licensed therapy dog. We have no doubts that he will be the best therapy dog there is.